Okay, so I am wanting to switch to Straight Talk.. from a Verizon plan. It says my phone is eligible and I can keep the same number. I would just need to get a new SIM that originates for Straight talk, etc. If I were to engage in this process.. does anyone know how long it would take to port my number over? I am wondering how long I would be without a working phone. Of course, i don’t want to run into any complications with this but it needs to be done. Make sure you have all the information about your Verizon account available. You’ll need to know your phone number, account number, and your Verizon account PIN. This PIN is a number you set to protect your Verizon account, not the PIN you may use to unlock your phone. If you are not sure call Verizon to ask for this information. In my experience, most number transfers are done reasonable quick, occasionally I hear of them taking a day or two. Sometimes the transfer may not go through and you need to call Straight Talk to get them to correct whatever information they need. If you search the web, you’ll often read “horror” stories about transferring numbers to Straight Talk or other prepaid wireless services. While I am sure some people have had problems, its hard to say how common it is because most people only post online when they have a problem, not when things go as expected. You did not say which phone you use or which Straight Talk towers you’d want to use. Depending on your phone and the service avaialable in your area, you may have a choice between their Verizon, AT&T, or T-Mobile towers. If you are not clear how this works take some time to understand it so you can make the best possible choice. Since you are a Verizon customer already, I’ll assume you want to use their Verizon towers. If that is the case, I’d also recommend you take a look at both Total Wireless and Net10 to see if any of their plans are more appealing to you. 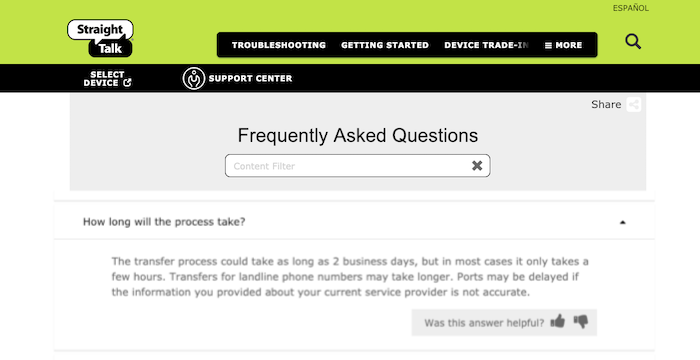 All three companies are owned by Tracfone and the service is pretty much identical but the plans are different. Finally, if you call Verizon to verify your account number and PIN, they may offer you a new lower rate when they realize you are getting ready to switch carriers.